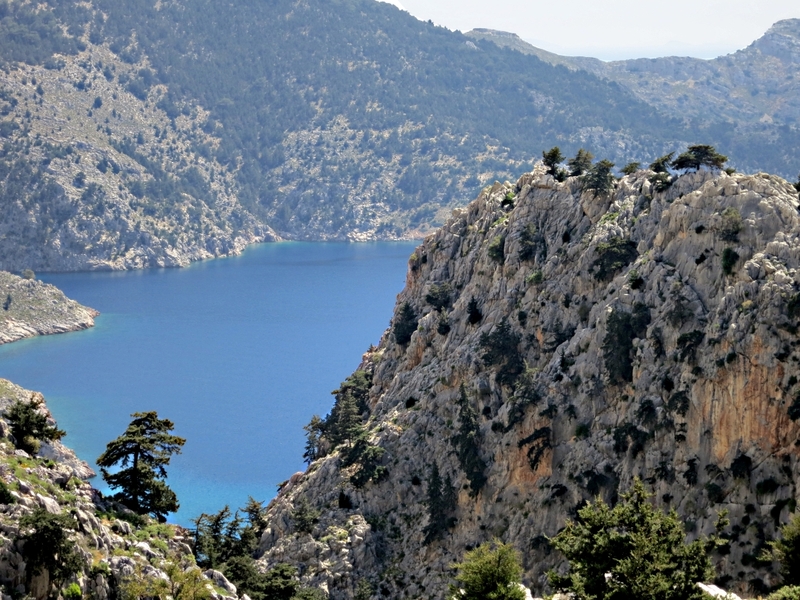 ← From Rhodes to Symi: new beginnings and a whiff of death. On my one full day on Symi I walked across the island to Agios Vasilios, a bay on the far side with a tiny monastery nestled into the cliffs. It was always a favourite with my late wife and I not only because it is such a beautiful place but because it offered complete peace and solitude. Only occasionally did other walkers trek over there and the beach was plenty big enough to accommodate the few who did. In recent years however boat trips around the island from the main harbour have taken to making it one of the stopping-off anchorages for a swim and high speed boats zoom in for a picnic lunch. On Monday I had the walk and the beach entirely to myself. The trip boats have not yet started business for the season and there were no power boats around. 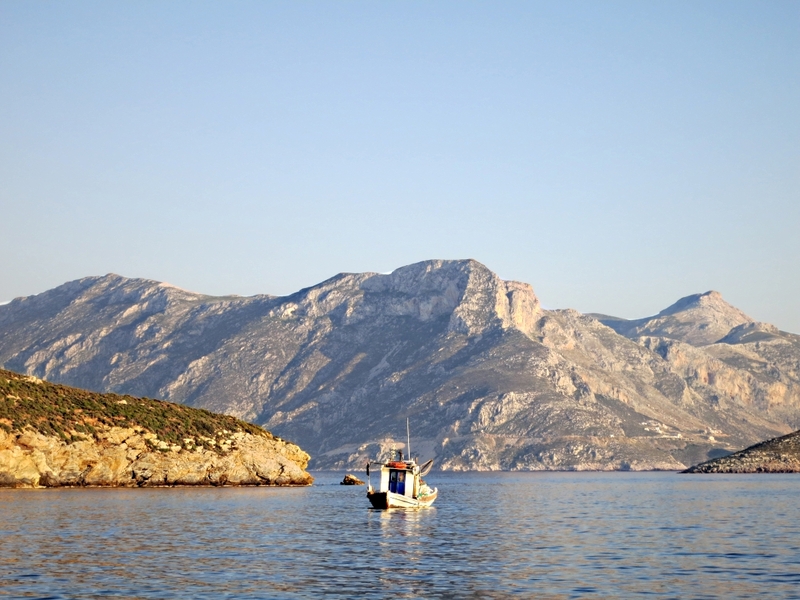 The only sign of life was the very occasional fishing boat drifting across the entrance to the bay, almost silent except for one playing Greek basouki music loudly as the fisherman went about his tasks. 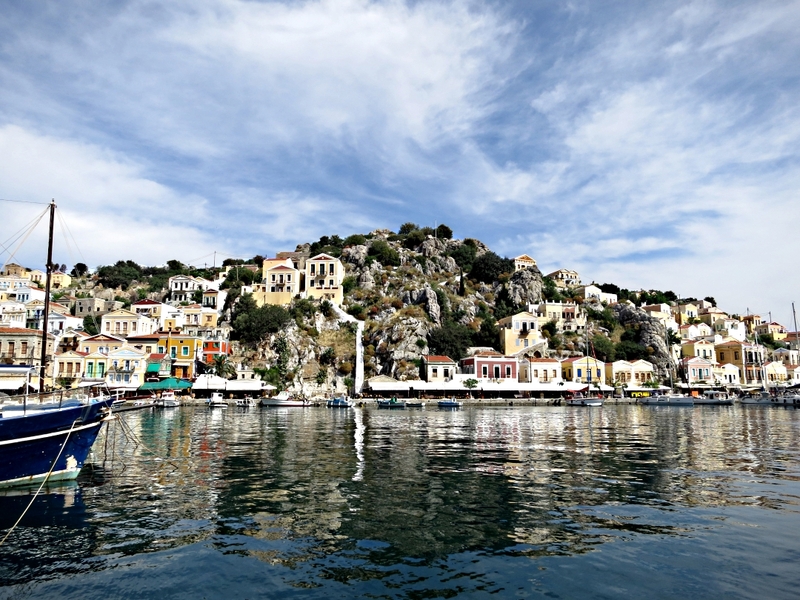 Flat calm sea, peace and quiet in Yialos, the main harbour on Symi, stark contrast with the yachts and gin palaces crammed in during the summer. On the way back to Horio from Agios Vasilios. The view down to the harbour one of the most dramatic in the Aegean. 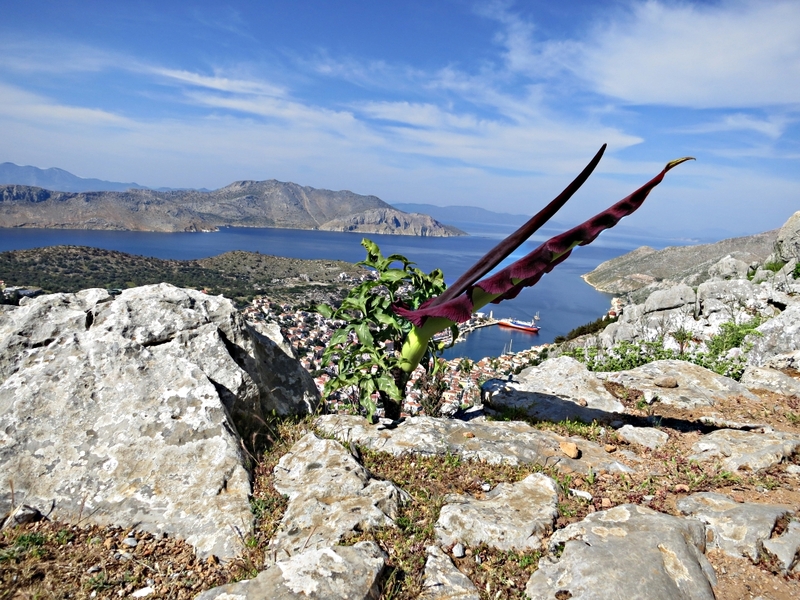 Tuesday and my brief stay on Symi was at an end. The 09.30 high speed cat took just over two hours to race north to Kos and then to Kalymnos and a different world. The main town, Pothia, was bustling, there seeming to be far more motorbikes and scooters than I remember, probably because many Kalymnians who have moved to neighbouring islands or Athens come back for the dramatic Easter celebrations for which the island is famous. Not that I’m staying in the main town, so the noise was only temporary. I took a bus to the other end of the island and the tiny village of Emporios. It has two buses a day, no ADSL and no 3G signal. This presents communication problems and will severely curtail posts on the blog. 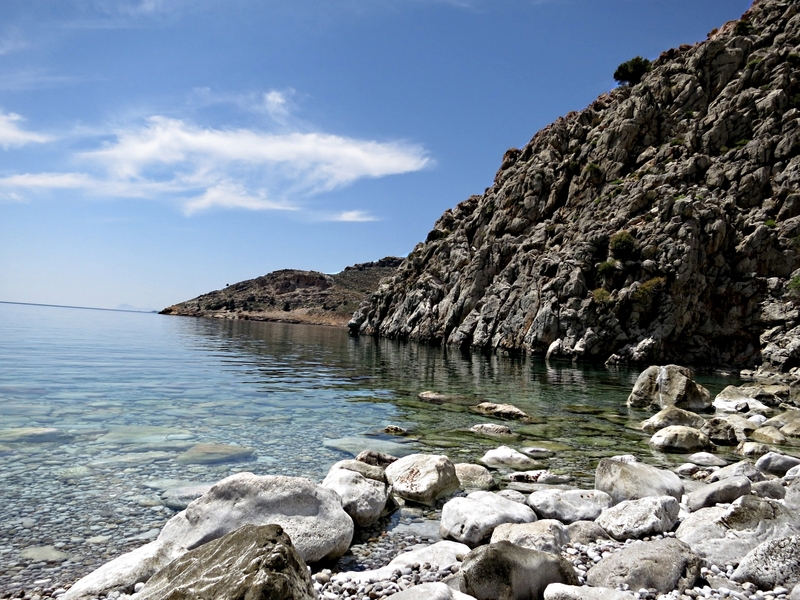 But as a place to stay it’s about as tranquil as you can find, best defined by the Greek word ‘ησυχία’ (isihia). The bay at Emborios on Kalymnos, about as tranquil as it gets. By contrast, ‘ησυχία’ is not what is on offer for the Easter celebrations. But that is another story. 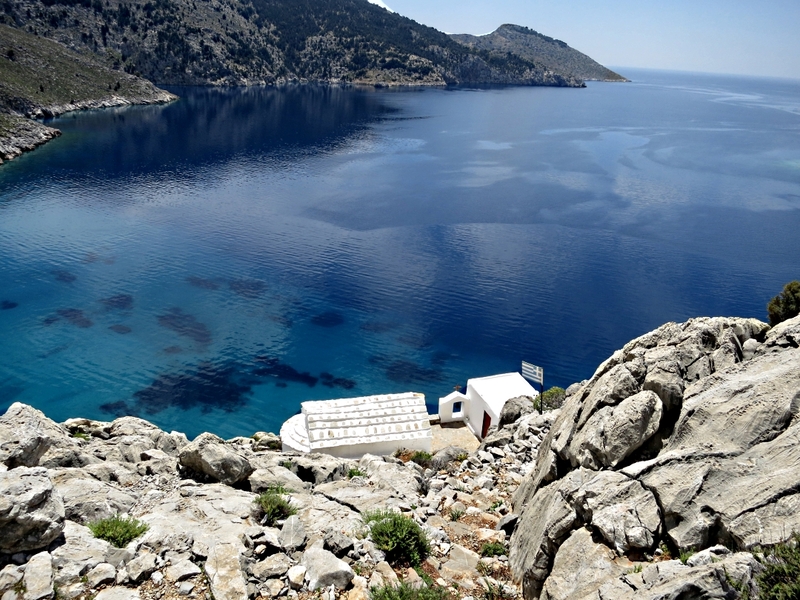 This entry was posted in Greece and tagged Agios Vasilios, Emborios, Greece, Horio, ησυχία, Kalymnos, Lapathos Bay, monastery, peace and quiet, Pothia, Symi, tranquility, Yialos. Bookmark the permalink.